Today I got to spend time just with my daughter, as the nursery opens earlier than school (thank goodness!) Normally one-on-one time with my daughter doesn’t go so well, because we are quite similar and therefore fall out pretty easily. But today we seemed to be on the same page. After that we tried to go to a soft play centre, which turned out to be closed, so ended up in McD for a promised treat. I’d agreed to have a kids’ meal too, so I could get my son a toy as well, and the lovely lady went through and let us choose which toy. I have to confess, much as I hate to like a huge conglomerate like McD, they offer lovely service, and games and colouring to entertain energetic children while tired parents drink nice coffee and surf the free WiFi. 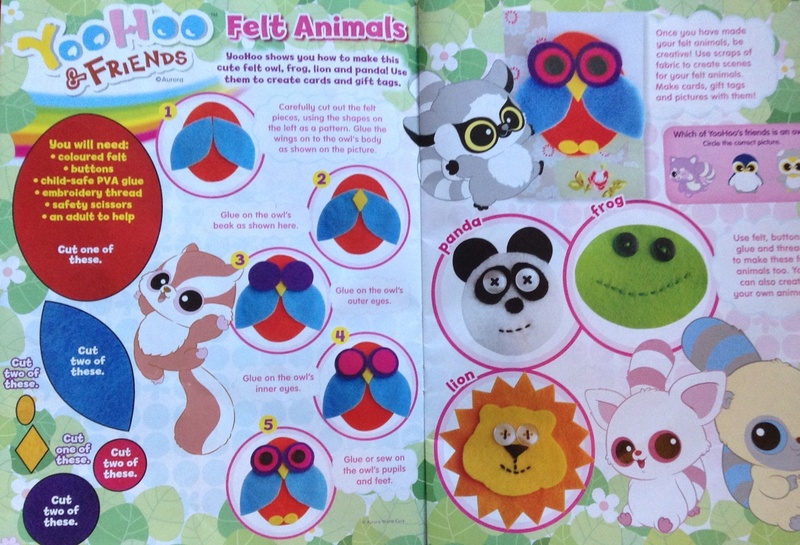 This afternoon has been all about craft and learning to sew and weave, as we worked our way through my daughter’s magazine of ideas. I think she’d be better off learning from my mum, who is a whizz at sewing and knitting, and I dearly wish hubbie’s mum was still with us, as she was an extremely talented dressmaker by all accounts. 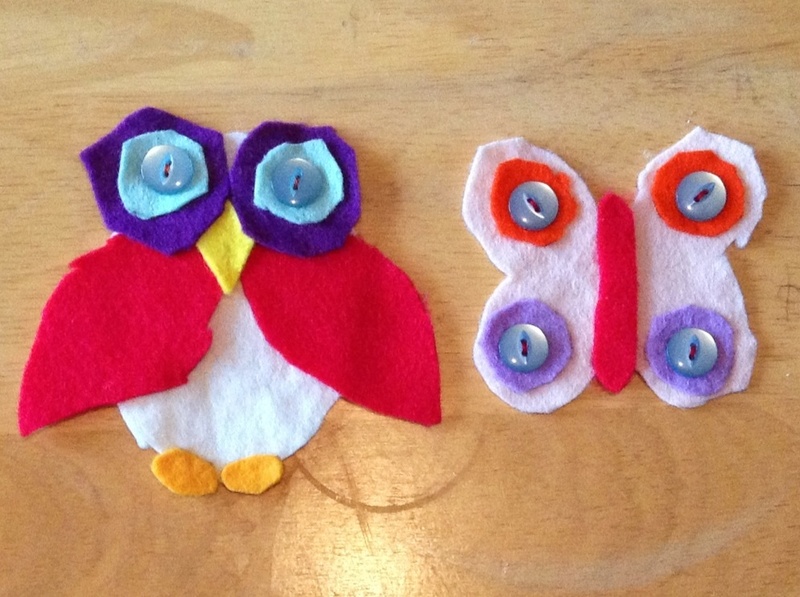 Still, I have the rudiments I learned in Home Ec classes, and we managed to sew buttons on our owl and butterfly without too much bloodshed. The woven magazine basket was a clever idea, even if it’s probably held together more with sticky tape than skill. 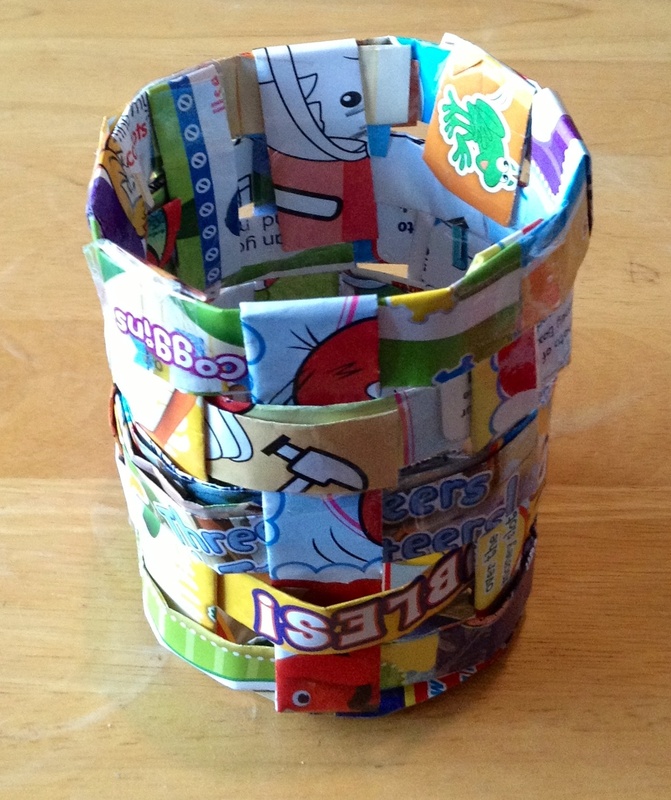 At last something to use up all the half-read magazines in the drawer! The craft would have continued, but all my energy and patience was depleted, so now we’re sitting together on the sofa while she learns phonics on one ipad and I write this on the other. It’s been an encouraging day. 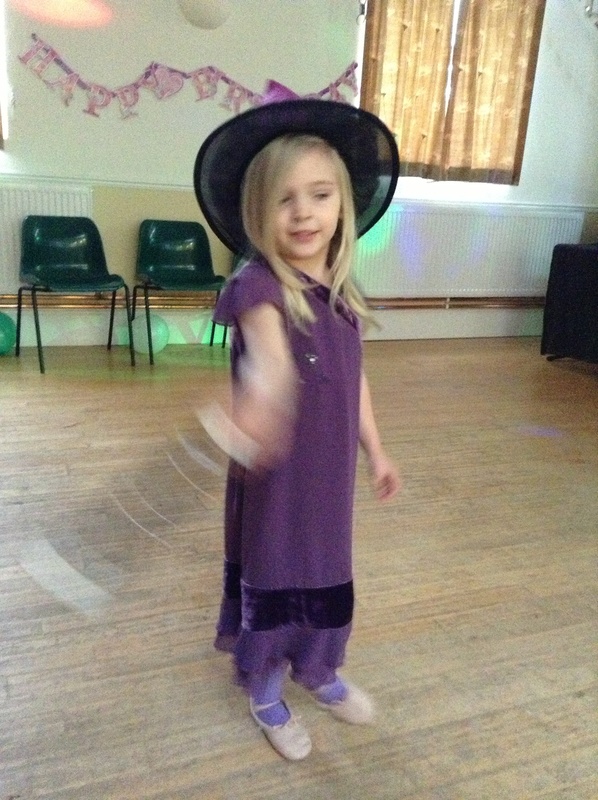 My daughter is wonderful, caring and kind, but also bossy, demanding and thoughtless. We fight more than we are friends and I often worry what our relationship will be like as she grows older. I don’t have many close friends or family members and I long for the kind of mother-daughter relationship where we can shop and have a giggle together. Today we came a tentative step closer. And so another Christmas Day draws to a close. Hubbie is watching Star Wars on the TV, the children are fast asleep, the house is littered with piles of new possessions and the dog is slumped exhausted on our feet. It’s been a wonderful day. The sun shone brightly from a warm sky, without a breath of the predicted storms and gales. Aside from a small panic attack (literally – hubbie tells me it was quite impressive) when Santa’s Little Helper discovered some gifts hadn’t made it into daughter’s bag, as she opened her last present, all was well. Some swift thinking (“Why don’t you go and bring Mummy’s gift upstairs, children?”) and the hiccup was skimmed over. We rode through the tantrums and tears, the whining and the “want more”. We walked to the park and enjoyed being the only ones there. Our daughter opened nearly every gift with the words, “It’s exactly what I wanted but forgot to ask for!” (Funnily enough the abacus didn’t get much interest) and our son just about grasped the concept that some of the gifts under the tree weren’t for him. For the first time in a long time, every gift was just right. All the hours spent worrying and researching, buying and wrapping, were rewarded with smiles and thank yous and happy children. All the time spent preaching gratitude and patience seemed to pay off. Prior discussions on gift opening strategies were mostly adhered to and the only change to the plan turned out to be the right one. 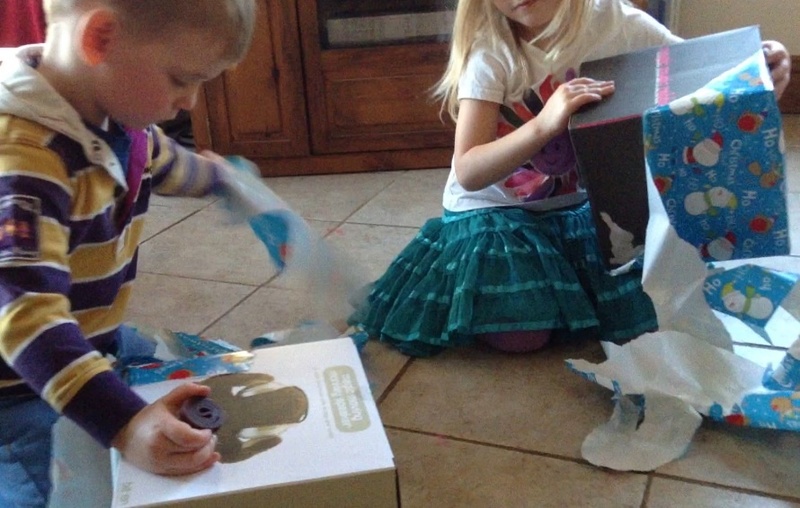 Gifts were opened and played with, rather than instantly discarded for the next unwrapped box. That, more than anything, made me happy. The day became about more than just getting stuff, it became about sharing family time and having a giggle. We played Three Little Pigs, and blew each other’s houses down. 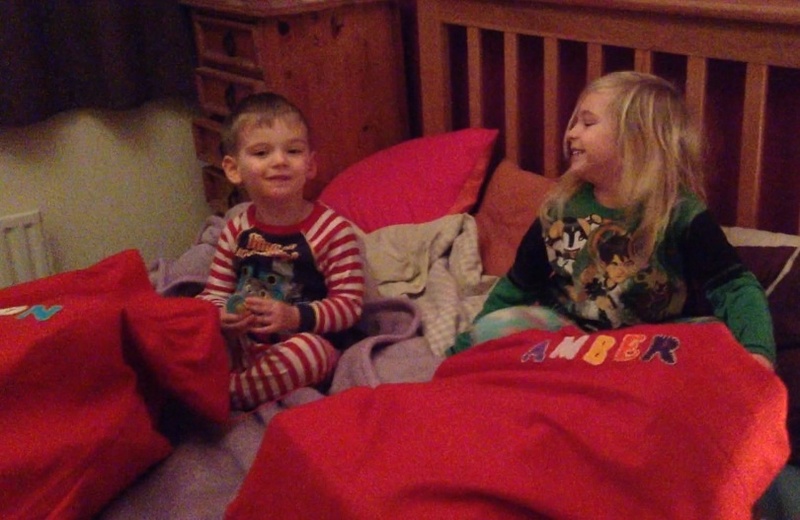 The children did some Christmas Jammin‘ (my rock star kids!) and shot cars across the room with the gravity loop. They painted pictures and did craft. It was an interactive day and I loved it. All of it got me thinking about how planning for Christmas Day is a lot like writing a novel: You put in days and days of hard work, and the output is ‘consumed’ in a few hours. You wonder whether the effort was appreciated, but you know that the lasting memories are created by the attention to detail. Not just the grammar and punctuation, polishing and editing (think wrapping and tag writing) but also the understanding of character, the manipulation of plot (or taking note of wants and likes, and strategic gift-opening order). Details that go unnoticed but enhance the experience and enjoyment. And, like writing a novel, the echoes last long past the consumption. We don’t have many photographs from the day today, because for once I wanted to participate rather than record, but even blurry snaps of happy faces tell a story. This Christmas was one where I put all the effort in upfront and then let the recipients connect it together into an experience. Hopefully it was a happy one for all. It certainly feels like a job well done. Claire looked out over the cloud-draped hills of Glastonbury Tor and sighed. It was beautiful. A different beauty to Cornwall, although she couldn’t put her finger on exactly why. Driving down the lanes, the roads were wider, the hedges lower. Even the trees seemed different in Somerset; tamer somehow. Now I am being silly. Counties are artificial boundaries. The trees don’t know whether they’re Cornish or not. Yet there was a difference. As she travelled back towards Dorset, ready to deliver her final report, she felt the pull of the Cornish coast like a cord attached somewhere beneath her ribs. No matter how hard she tried to rationalise the sensations, they refused to be controlled. Dorset or Cornwall, there was nothing and everything in it, and it had sod all to do with the trees. The sky along the horizon darkened, despite the sun directly overhead, and long legs of rain stalked across the hills, pulling the clouds down to earth. It matched the heaviness in her heart. It had been nearly two weeks and still there had been no response from Conor. She told herself she didn’t want to date a sulker anyway, but it didn’t lessen the pain. Instead she’d buried herself in the report, making sure every last detail was correct. It stretched to hundreds of pages, and the presentation she was to give in a week lasted an hour. How am I going to stand for an hour and talk, with him watching? She shuddered. That was why you didn’t fraternise with colleagues or bosses. It always went wrong in the end. Well, he won’t be my boss or my boyfriend from next Friday. This time next week I’ll be starting a new life, with Timothy and Gemma, Louise and Eddie and all the others. It wasn’t exciting. Petrified was probably a closer description and every day started with a rehearsed conversation to Timothy explaining that she’d changed her mind. Claire turned and got back into her car. It was only a short distance to the next hostel and she was keen to check in before the stalking rain reached her. She wondered if the concert that evening was under cover. The world rolled away like a rumpled blanket as she drove along the lane, passing stiles and footpath signs that called to her to walk the hills and get wet. She fought her maudlin mood, determined not to succumb. She hadn’t realised how much she’d come to rely on the daily messages and calls from Conor, until they stopped. But with her attempt at a peace-offering rejected, her pride prevented her repeating the gesture. Is that why I’m going to a gig? To show that I can enjoy loud music and crowds without him? She wasn’t sure why, only that when she’d seen the poster and realised it was that evening, she’d had to go. Claire viewed the multi-peaked blue and yellow striped tent with relief. As the clouds jostled for room in the sky above, and the rain began to fall, it was good to know there would be some shelter from a storm. All around, people walked with golf umbrellas threatening the eyes of their neighbours, or coats held high above styled hairdos. Girls in short shorts and tight t-shirts wandered alongside blokes with crates of beer cradled in their arms. Turning up the collar of her waterproof jacket, Claire let the rain cool her skin. At least I don’t have to worry if my hair turns into a ball of frizz. How nice to have outgrown the days of being on the pull. The sound of the first band warming up filled the night air, as bodies crammed under the striped pavilion. Claire could see the stage in the distance; a rectangle of colour and light calling everyone forwards to join the party. Hanging outside away from the crush, Claire watched the milling people, feeling removed from their tanned skin and immaculate make-up by more than a few extra years. Am I going to be able to relate to disadvantaged children? What do I know of their lives? I’m old before my time: look at me, with my sensible coat and shoes, drinking water and staying away from the noise? I feel like I’m in my thirties. When did I get so ancient? As evening fell, the bonhomie expanded, travelling through the crowd by osmosis, until the beat and the laughter could be felt even at the edge of the enclosure. It seemed to flow around Claire as if she were a rock in a stream. Deep in the crowd she saw people on their partner’s shoulders, rocking to the music. A loud crack rent the air and she jumped. Her hammering heart drowned out the music as she spun round, trying to locate the source of the noise. She was just in time to see a long fork of lightning strike the ground behind her. The power of nature drove through her, leaving her shaking, and she ducked under the cover so as not to be an easy route to earth for the next strike. Instinctively she looked around for Conor, to make sure he was okay, and her face fell when she remembered those brief days of companionship were over. Damn you, Conor. Damn your stupid male pride and your fickle, grasping, ex-wife. Claire stepped back out from under the canvas, no longer concerned whether she was a target, and let the rain wash away her tears. I promised hubbie that I’d take the children to one of our regular Farm places today, so he could have some time to get things done and look at assembling their Christmas pressie (a trampoline: only it turns out some important bolts are missing. Eek). Unfortunately a storm has hit the UK and the weather is just plain awful. We do try not to teach the children about good weather and bad weather (the proper line being ‘good clothing’ or ‘the wrong clothing’) so I duly dressed them in wellies and waterproofs and off we went. But my god it was miserable. Freezing cold with sideways sleety rain and a wind that could easily blow Dorothy’s house out of Kansas. 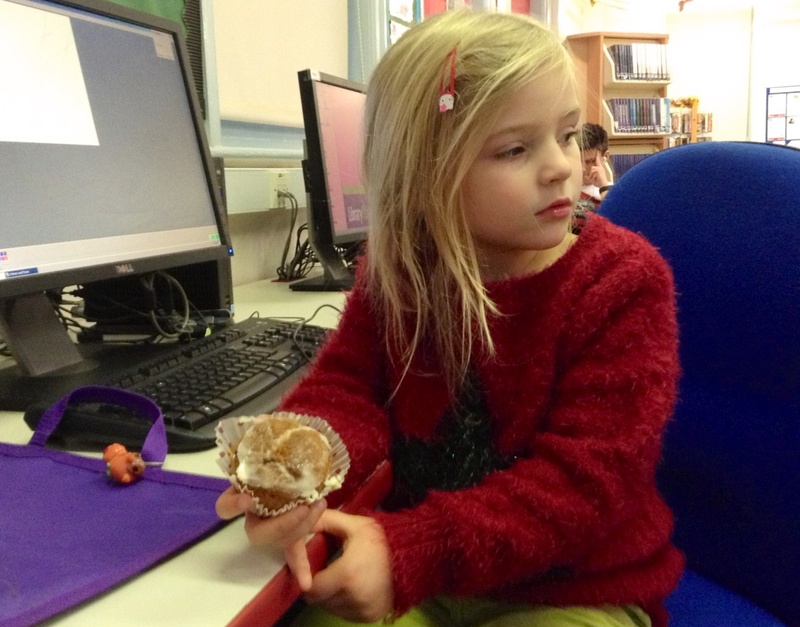 Thankfully there were lots of Christmas events on, most of which were under cover, so we survived. 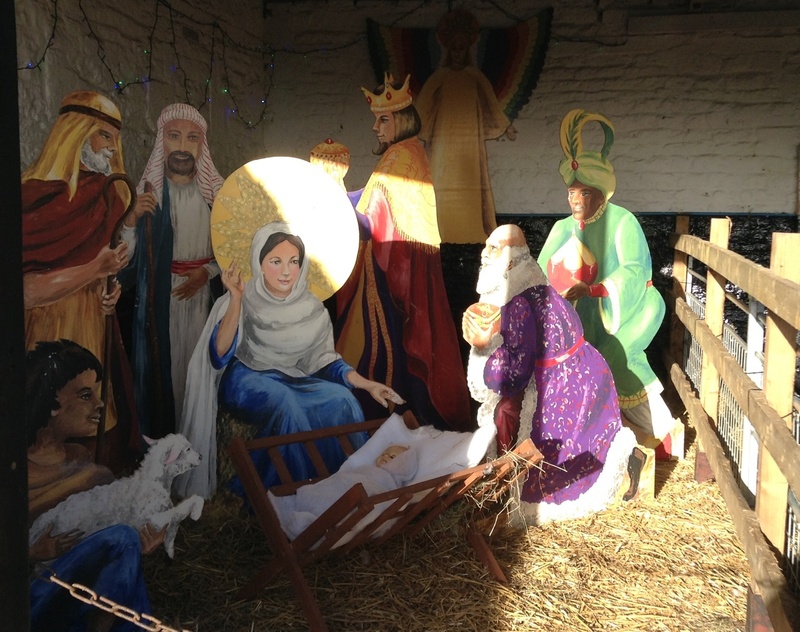 The nativity was my favourite: they selected children from the audience, dressed them in costumes, and fed them their lines, while the grown ups sang carols. It was charming. Apparently they normally parade animals across the front too, but I guess it was too busy or wet today. We did get to see the 24-year-old highland cow, though, sheltering in the barn, nice and warm. Which was more than could be said for the ponies, out in the field drenched to the skin. The children still wanted their pony rides, so we battled our way to their field and I stood getting drenched while they had their trips round. Mummy needs to buy some waterproof trousers! 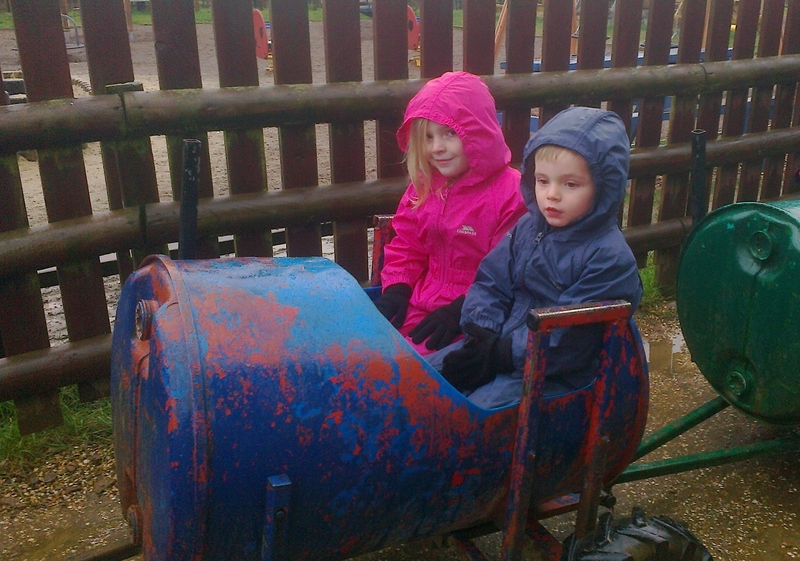 We fitted in a quick trip to the play barn, a ride on the barrel train in the rain, and a visit to the coffee shop where the children refused to eat their ice cream because they didn’t have chocolate, only strawberry. 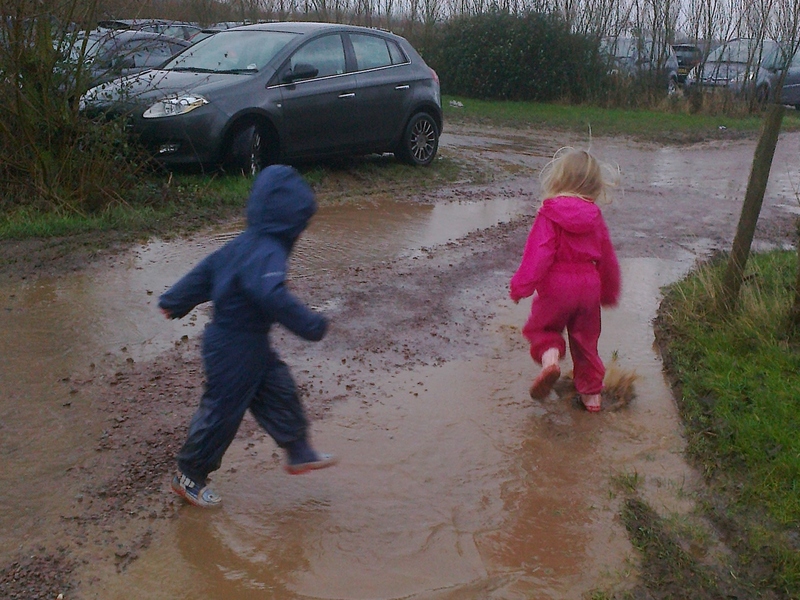 Of course the highlight of the day was jumping in the puddles in the car park! I’m not sure they used up much energy, although Mummy was pretty exhausted, but at least they had plenty of fresh air! It doesn’t feel very Christmassy with the awful stormy weather (not to mention what it’s doing to our Sky reception!) and I really feel for anyone having to cross the country to visit relatives. We are fortunate that ours are two miles down the road. Whatever you’re doing this holiday, whether you’re home or away, stay safe, and Happy Christmas Eve! Claire drove down the tree-lined road, following the SatNav, unable to see anything past the tunnel of green. A spark of excitement built in her chest and she tried to ignore it, afraid of what it might mean. Eventually the woodland thinned and the computerised voice announced her arrival. To begin with she couldn’t see the entrance, but further down the road she spied a discreet sign at the head of a lane. She turned in and bumped down the pitted track towards the building. More trees concealed the view until she came out into a clearing and gasped. Ahead was a sprawling mansion, all windows and chimneys, surrounded by exotic trees and endless rolling parkland. It looked more like a National Trust property than a children’s activity centre. As she parked the car, Claire wondered if she’d come to the wrong place. With her heart in her throat, and half expecting to be accosted for trespassing, she climbed out and went in search of Timothy. The place was eerily silent. Claire had imagined it would be bustling with people. If not children, then staff or even workmen finishing the renovations. Convinced now that she had come to the wrong building, she was about to retreat back to her car when she heard a voice. Searching round for the source, she heard the cry again and looked up. She could just make out someone waving at her from a first story window. Shielding her eyes against the sun, she realised it was a middle-aged man and assumed it must be the elusive Timothy. The head disappeared and she waited, looking around her in bemusement. Everywhere she looked was green. Ivy climbed the white walls of the house and wrapped around the chimneys. Held back by low stone borders, flowers and bushes provided a riot of life and colour. Behind the house she could see an immaculate lawn stretching down to the sea, which shone brilliant blue against the sky. It was heaven. Before Claire could begin to imagine living and working in such an idyllic spot, the owner appeared before her, holding out his hand. He was a tall man, lithe, with hair that might once have been chestnut but was now sprinkled with grey. The lines at the corners of his eyes spoke of a life full of laughter. Claire shook the offered hand and returned the smile. “Yes, no problem. The Sat Nav brought me right here. What a gorgeous place.” She looked around, not believing what her eyes showed her. Inside was equally magnificent. Dark wood panelling ran around the walls, leading to a wide staircase that invited you to explore upstairs. Deep pink carpets ran throughout, giving the place an air of an old hotel. Timothy led her through a large social room full of faded sofas and long benches, with patio doors that opened onto the garden, until they came to the kitchen. “Tea?” he asked, heading to one of the cupboards. “Yes, please.” Claire sat near the window and looked out at the view. After a few moments, Timothy walked over with a laden tray. “Only that you’re opening an activity centre for disadvantaged children.” Claire selected a piece of cake and nibbled at it. Claire felt slightly uncomfortable at his words. His motives were admirable, but she wondered if it was all a bit patronising. Inner city children were just children after all. It felt a bit like alms to the poor. But what do I know? I have no experience of what it must be like growing up in a city and perhaps never seeing the countryside or the sea. Who wouldn’t want their child to be able to come here and experience this? “And where do I come in?” She looked into Timothy’s eager expression and could understand why perhaps they needed some business help. Some of Claire’s distaste for a sales role must have showed on her face, because Timothy’s expression dropped ludicrously. Words of denial were in her mouth, when Claire really thought about the question. Did she like spending time with children? She thought back over her trips with Sky, and Alex and Jack, and thought maybe it wasn’t so bad. And if it meant getting to live in such a beautiful location, with views over the sea and endless space, it was worth a try. He stood and indicated for Claire to follow him from the room. Her thoughts scurried around her head like mice as she tried to process the interview, if that was what it could be called. Her sensible brain told her to get out while she could, reminding her that she didn’t like her own family and wasn’t in search of a new one. But some instinct kept her following Timothy to the dorm rooms. Something told her this just could be her next big adventure. Luckily Daddy took the little darlings shopping for Mummy’s Christmas Gift this morning (socks, socks and more socks, hurrah!) so I was able to finish my Father Christmas duties, clean the house, walk the dog and try to write some more adventures for Claire. I lost an hour of precious time trying to find a building on Rightmove that fitted my mental image of what Timothy’s activity centre should look like. I love shopping for £3 million properties on the Cornish coast. In the end I had to use a blend of three different places. Fun though. Unfortunately a shopping centre on the Sunday before Christmas is not the place to wear out small children (I suspect they could barely even move) so the kids were bouncing off the walls by 2 o’clock. Despite my hacking cough and permanent need to sleep I just about managed to dredge up enough energy to get the kids baking Christmas biscuits. It was a shame my cupboards were mostly bare and I only managed to scrape together enough ingredients for a handful of tiny morsels. 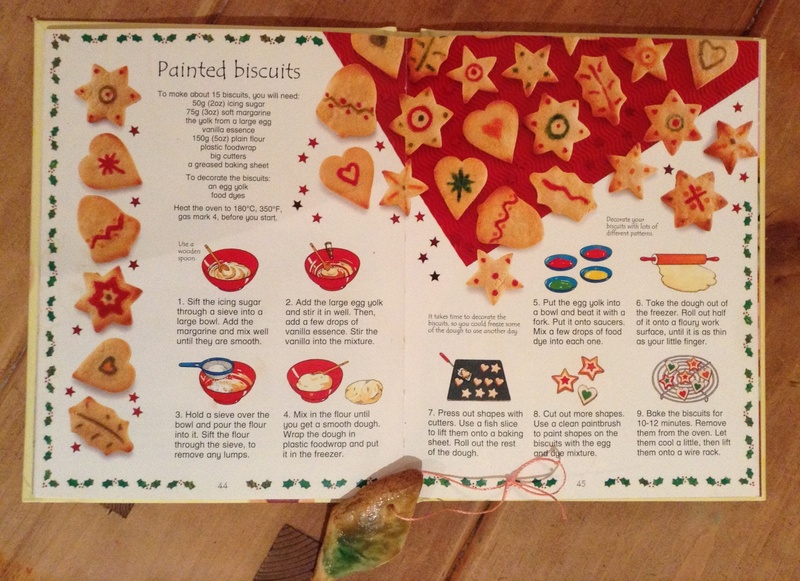 I’d really like to have a go at making the little stained glass biscuits I keep seeing around (and that happen to be in my cookery book) but I had no plain flour, boiled sweets or brown sugar. Slight problem. But we did manage to locate eggs, icing sugar and vanilla essence, and voila! 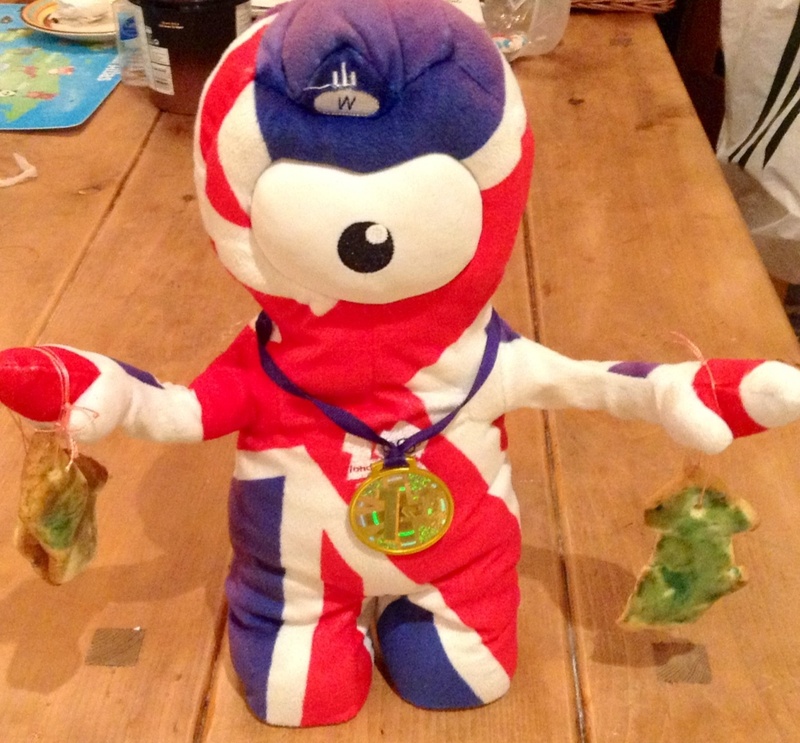 They’ll look better on the tree than they do hanging from the hands of Wenlock, but they weren’t bad for a first effort. Of course if I ask my children to mix colours, I inevitably end up with black, so they’re more suited to Hallowe’en than Christmas. The thing I like about these biscuits, though, is that you decorate them before you bake them, by adding food colouring to egg yolk. No need to wait for them to cook and cool down before icing them. Lord knows how you get intricate patterns like in the picture, though. Ours were mostly solid blocks of green! Still, it filled an hour. Claire stared at the green and white livery of the coffee shop sign and let the familiarity enfold her like a blanket. She sipped at her tepid latte and tried not to think. Her eyes ached, and her skin was tight from salt and lack of sleep. Against her will, images of the night in Cobh, and the long the flight home, played on loop, until she felt she might go crazy. The tension had been unbearable. There hadn’t been space for words. Her pain at Conor’s deceit – not his marriage so much as his method of telling her – clashed against his sense of betrayal at her considering another job. She had no more understood his shock than he had her sense of humiliation. Despite repeated efforts to talk it through, they had been unable to find common ground. It was as if, somewhere between Claire stalking from the Baptism and Conor coming to find her in the hotel bar, they had become strangers. They’d said farewell at the airport without touching and Claire wondered if that was the end. All the while her heart asked the unanswerable question: was it really so important to strike out on her own, to start a new life in Cornwall, rather than putting down roots working for Conor? She could probably forgive his stupidity, letting his little sister fill her in on his history. But would he ever accept a long distance romance, especially after his wife moved across the Atlantic with his unborn child? For a moment the need to comfort his decade-old hurt overwhelmed her and she reached for her phone. Then his stubborn anger at her conversation with Maggie played loud in her ears and she stopped. She stopped as her errant brain added adjectives. Charming, gorgeous, generous, kind. “Stop it,” she muttered out loud and blushed as the woman at the next table gave her an odd look. Why can’t life be simple for once? She drained the last of her cold coffee with a grimace and pulled out her phone. Her heart was in her mouth as she waited for the call to connect. Guilt swirled around inside Claire like whiskey in her stomach. Even driving across Cornwall to the activity centre to meet Maggie’s friend Timothy felt like a betrayal. No matter how many times she reminded herself that she had no obligation to Conor past the end of the three-month contract, she knew how hard he had fought to get the role for her. And how essential it had been to know she had a job to return to, after leaving the darkness of her New Zealand journey behind. And is this how I repay his efforts? Running away at the first opportunity; abandoning him to the censure of his peers. Regardless of our relationship, if such a thing still exists, I owe him more than this. She knew the words were true, but another, quieter, voice said, Working for others got you nowhere. You need to do something for yourself. Still, she felt beyond selfish, and wasn’t surprised that Conor hadn’t tried to get in touch since their arrival back from Ireland two days before. As she followed the directions of the SatNav, every junction caused her to hesitate. She could turn round, go someplace different. Stay in a hostel, work on the report. It wasn’t too late to choose Conor. Every cross roads felt like a waypoint in her life. Before long she felt exhausted. 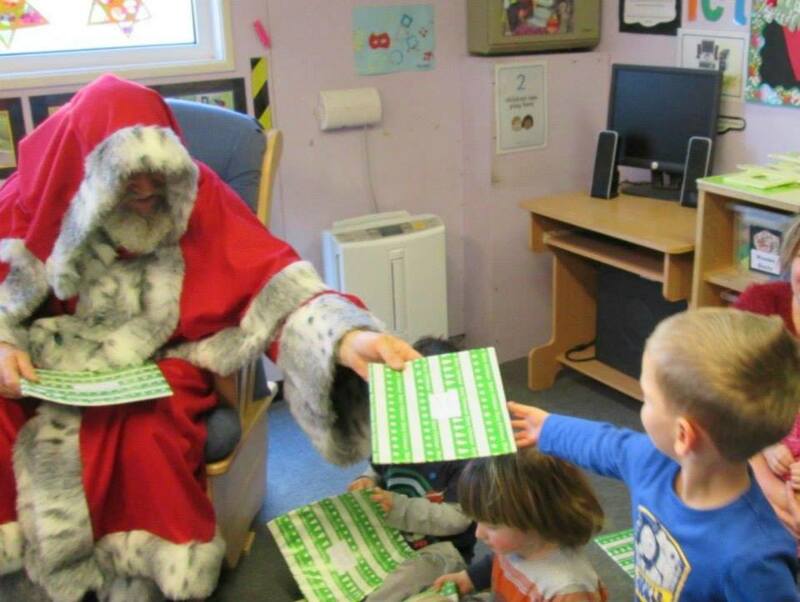 Yesterday I went to my son’s nursery so he could get a gift from Father Christmas, and then in the afternoon we went to my daughter’s school to attend story time. Both visits were an opportunity for me to spend a length of time in the place where my children go when they’re not with me. It was quite an eye-opener. Even taking into consideration that the events meant it wasn’t ‘business as usual’ there were still elements of both that concerned me. At the nursery I saw how hard it was for the staff to rein in the exuberance of the excited boys, who were throwing toys and being boisterous. Without being about to shout (which is probably a good thing) or give time outs and so on, it seemed hard to find the balance between play and potential danger. Even with four adults in the room it felt like a place of stress and unhappiness rather than fun. I also saw that it was a difficult environment for boys with energy: the bouncy children I watched were pulled up long before I would have stepped in at home. With other people’s children I guess you can’t be too careful. But there doesn’t seem to be much space for them to let off steam safely without being reprimanded. At home I would have sent my son to the trampoline to burn off energy, but a school doesn’t have that opportunity. I also noticed my daughter wriggling and not paying attention at times, and I wanted to say something (but didn’t!) because I want her to be one of the good children that listens to the teacher. Wherever I am, when I’m with the children, I expect a certain level of behaviour and I will step in, even if they’re in a class (if I’m close enough to do so without being disruptive). 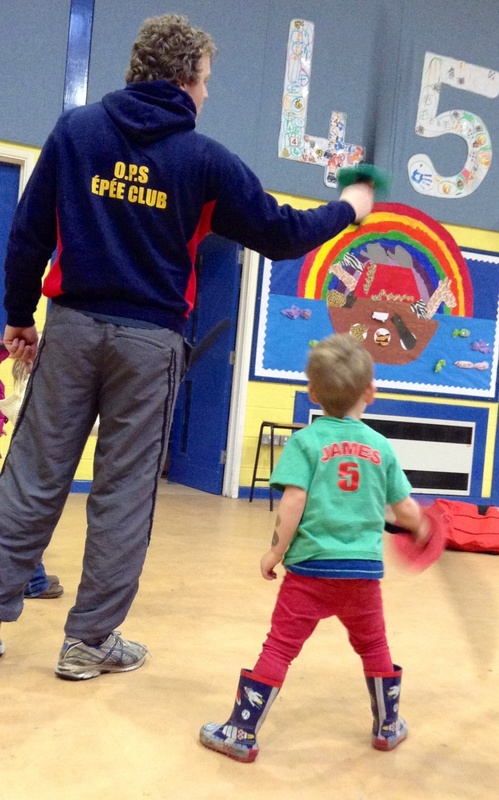 So I’ll tell my son to listen at gymnastics, or I’ll reiterate instructions at fencing. Because they’re my children and I want them to be good. But as I thought about it all last night, while streaming with cold, in that befuddled place your brain goes to when it’s ill, I realised that it’s important that my children go to school and nursery. Not just because they can get away from shouty Mummy (yesterday wasn’t my best day!) and spend time with different adults, and learn and have friends and all that. It’s also good that they spend time with people who have greater perspective. Because compared to the boisterous boys, my daughter is an angel, and I know I’m too hard on her. I’m hard on her because my parents were on me. I’m hard on her because I have no perspective (and quite often not enough sleep). I’m hard, but I’m not consistent and sometimes I’m not fair. Poor child. I want to be the perfect parent, but I most certainly try too hard and I most certainly fail much of the time. I wrote a while about about the importance of learning to fail. Of learning that it doesn’t have to be 100% all the time and that 65% is enough. But it’s hard, as a parent, to give a child that room to be themselves. At school, at nursery, where there are lots of other children contending for attention, all with different strengths and weaknesses, it’s a space where a child can learn to succeed and learn to fail and get the same reaction from the nearest adult. It made me laugh and cringe, because it’s too true. I want my kids to be confident, but I shatter their confidence a hundred times a day, just because I’m stressed, tired or grumpy. School is a place where they might not have attention all the time, they won’t always be hugged when they’re sad (but then, they won’t get shouted at either); they might be bored, sad, lonely, hurt, naughty, wriggly or annoying. But they can be all those things without anyone trying to make them perfect. They can breathe. They can learn who they are away from their controlling parent (moi?) and find space to just be. Hurrah. Claire rested her head against the back of the wooden garden seat and gazed at the sky. From here it was easy to imagine the rest of the world had dropped away, leaving only a tiny walled garden and the endless azure heavens. She knew she should call Conor, but the silence replenished the emptiness in her soul. After the weekend with Kim and Helena – despite the happy conclusion – she felt drained and tearful. Why am I not happy? I have a gorgeous man who seems to care for me, my friend is on the road to recovery and reunion with her husband, and I’m close to finishing my report with time to spare. What is wrong with me? It felt ungrateful to the universe to be unhappy on such a gorgeous evening. She had spent the last few days wandering around North Devon, furthering her findings, talking to hotel owners and shop keeper and chatting to tourists. The weather continued to smile on her endeavours and she’d even managed a cheeky surf late one evening as the sky turned pink. Now she sat unencumbered and alone, with a cup of tea wrapped in her hands, while an invisible artist painted golden stripes along the horizon. She rested the mug on the bench next to her and turned so she could kneel and face the sea behind her. The shadow of Lundy Island beckoned in the distance – her destination for the morning – and the rainbow of sunset colours deepened to peach and rose. The buzz of her phone broke the stillness, and she sighed. I could always ignore it. He’ll call back, he always does. She smiled at the always. They’d only been together for just over a week. Aren’t I meant to still be giddy and excited in week two? Answering the phone with trembling hands, ready to talk sweet nothings for hours? Is this what dating in your late twenties is like? No magic. Flashes of the afternoon she had spent with Conor, after Kim and her sister left, filled her head. The magic hadn’t been lacking. Then what? That old cliché it’s not you, it’s me? Or it’s not the right time? Is there ever a right time to fall in … She stopped short. I am not falling in love. I barely know the guy. Lust, maybe. The phone continued to ring and eventually she picked it up, not recognising the number. Her peace shattered by the call, and the sneaky relief that it hadn’t been Conor, Claire was about to drop the phone onto the bench when she noticed a new email had arrived. Clicking on the message, she realised it was from Maggie. I didn’t even know she had my address. Puzzled, Claire opened the message, wondering what Maggie wanted. Although she had only met her a few times, Maggie felt like a friend; a steady force in a shifting world. I hope you don’t mind me emailing you – I found your address through your blog. I noticed that you’ve been travelling round the south west recently, and I wondered if you were still there? We are bringing the Guides on an adventure holiday next week and it would be lovely to see you. We’re booked into the Exford hostel in Somerset. I know it’s a bit away from where you’ve been recently, but if it was on your route it would be super to be able to catch up. We will be there all week and we have booked the whole hostel but as I am organising it, I believe I can find you a bed. Do let me know if you are free. I have been following your journey with interest and would love to hear the parts that don’t make it onto your blog. Claire’s face stretched wide in a smile of genuine pleasure as she finished reading. Without hesitation she tapped out a response in the affirmative, before she could worry what Conor would think. I’m sure that widening the remit of my report to include Somerset isn’t too far off brief. Besides, an association like the Guides is perfect research, and who better to interview than Maggie. Glad to have something to look forward to, Claire pocketed her phone and headed back into the hostel to eat. This festive season feels like an endurance trial, ticking off waypoints as we pass them. Today we struck off two that have been in the calendar for weeks and it felt great. Even when there is nothing that needs to be done (aside from buying and wrapping gifts in this case), stuff on the calendar always takes up mental space. So, hair cuts for everyone (except Mummy, who has off-set the £30 saved by not getting her hair cut against excessive Christmas spending at least twice!) 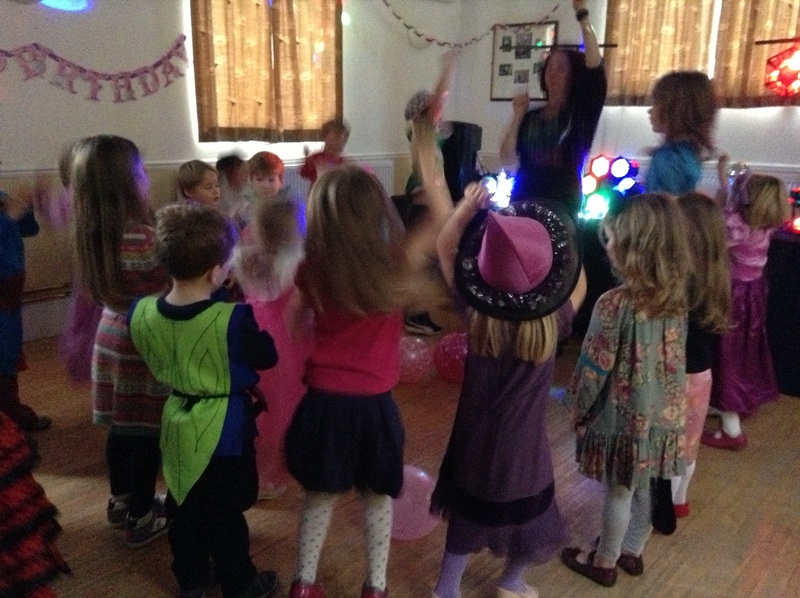 and then two birthday parties in the afternoon. Job done. The afternoon was the hardest. Hubbie and I were both suffering from our 3am insomnia (if only the cricket was more worth listening to, I wouldn’t mind my newly discovered inability to sleep) and the children had to put up with a certain amount of grump. I managed to make everyone dinner, do all the ironing and facilitate a play doh session, but crawled into bed at 8pm, unable to even stay awake for Strictly Come Dancing. I woke up at midnight, remembering I hadn’t written my post or even outlined my Claire installment. (And it seems I’m coming down with a cold which might explain a lot!) The knock-on of a spaced out Friday continues! I have just read a very funny post on Elf on the Shelf for under achievers which made me chuckle, and also made me wonder why we opt for any extra stress at this manic time of year. My physio friend is happy though – she says the insomnia isn’t confined to hubbie and I, and she’s getting lots of extra work with people needing massages to relax. It’s an ill wind, and all that. There’s certainly a strong, bitter, wind whistling round our house tonight. Brrr. I say, roll on Spring! An arm snaked across the bed and pulled Claire into a warm embrace. She snuggled into Conor, finding the spot to lay her head on his chest that already felt like the most natural place in the world. They lay entwined in the dimly lit room, not speaking. Slowly Claire opened her eyes, half expecting to see Conor’s apartment. The chill steel of the hostel furniture greeted her gaze and she was instantly awake. Events from the previous evening crashed into her like a runaway car. Claire’s thoughts skittered between memories of Kim’s vicious attempts at humour at dinner, and Conor’s hesitation over the word boyfriend. Why did such definitions get harder as you got older? You happily called a boy you never spoke to your boyfriend at school, but somewhere along the line it became loaded with significance. Conor fell silent and they lay wrapped in their own thoughts, with the thrum of their hearts beating loudly in their ears. Eventually they heard the unmistakeable sounds of life in the room next door, where Kim and Helena had spent the night. Conor came over and ran his hands down it, making her shiver. “I know.” His eyes gleamed in appreciation. “Down, boy!” Claire glanced over towards Kim. She thought of all the times Kim and Jeff had made her feel jealous, with their overt displays of affection. Even so, she felt self-conscious receiving Conor’s flattery in front of her and her sister. The hostilities seemed to have abated since breakfast. Kim looked drawn and tired, and Claire had to remind herself how hard this all was on her friend. It occurred to her that they should have invited Jeff, and she wondered why he wasn’t looking after his wife more. The awful idea that he had found someone else to comfort him germinated in her brain. It was difficult to imagine, but then he had lost a child and his wife, to a certain extent. Not that that made it right. Helena smiled and Claire wondered what she made of it all. She had remained mostly silent and aloof since her arrival and Claire found it difficult to read her flawless, expressionless, face. With a quick glance at Conor, whose face seemed to say, let’s skedaddle, Claire waved farewell to Kim and Helena and strode up the beach to where the surf came rolling in towards the sand. They had reached the surf school, where they had agreed to hire boards and have Claire teach Conor the rudiments. She had told him a proper lesson might be advisable, but he’d just grinned. “I guess.” Claire shrugged. It felt like it wasn’t her business, but she hated to see Kim so altered. Poor Conor, this wasn’t exactly the romantic weekend he might have hoped for. Determined to put in some effort, she reached over and gave him a lingering kiss. Just as he was getting overly amorous, she pulled away. “Last one in the water’s a rotten egg.” She pecked him on the cheek and ran towards the surf school to get her board. At dinner last night my friends and I discussed the challenge of maintaining the Christmas magic with our children. Do you lie? Evade, prevaricate? Are robins secretly Santa’s spies, identified by their red breasts? 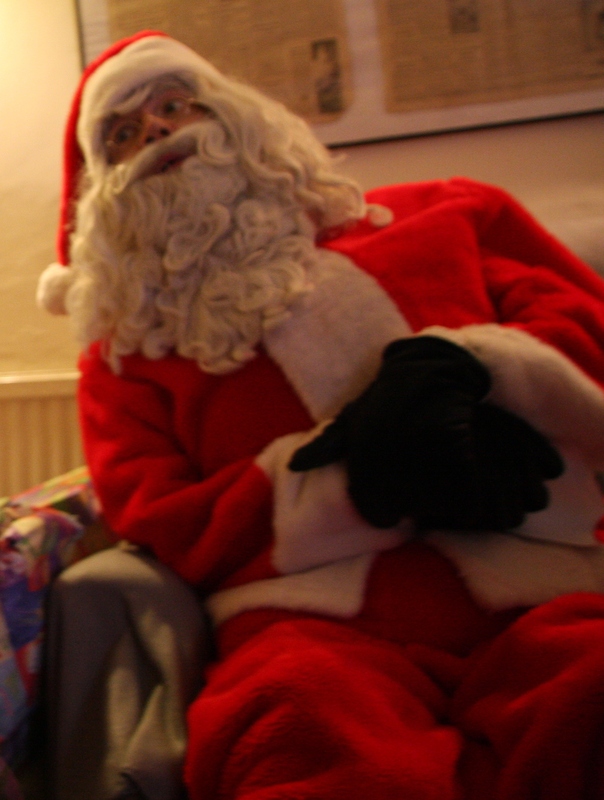 Or is the red flashing light of the security system Saint Nic keeping an eye on who is being naughty or nice? 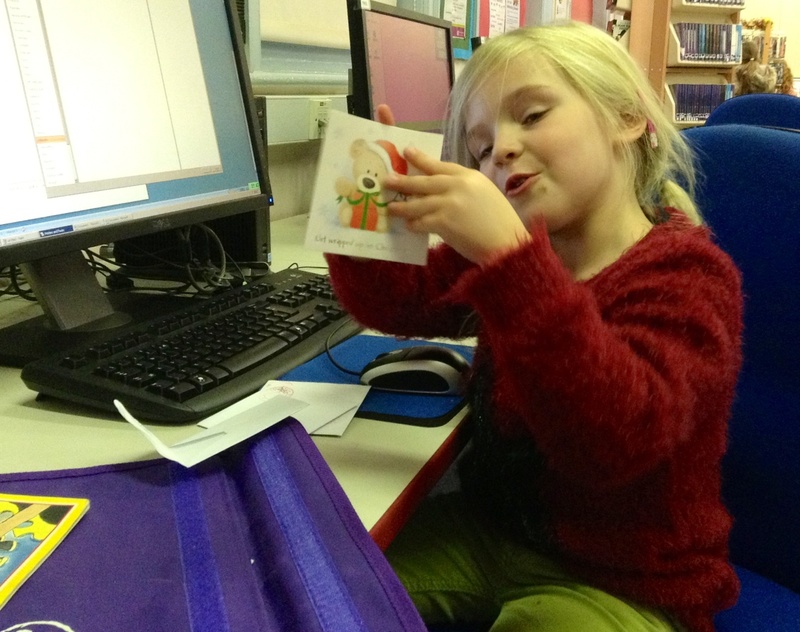 Do you have an elf on the shelf to watch over and guarantee belief and good behaviour? Interestingly as I googled it for this post I found some versions of the lyrics without this verse, and some saying “should be” rather than “must be”. 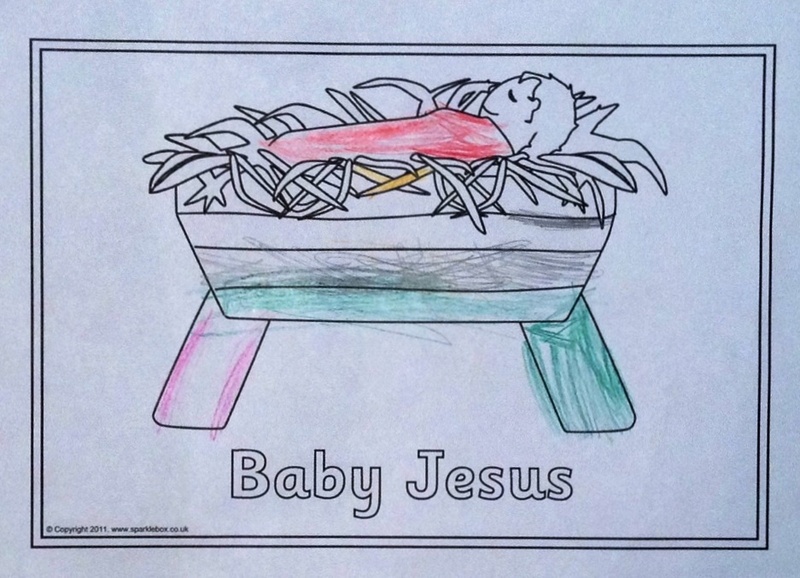 I’m clearly not the only person who struggles with the concept of telling my children to model their behaviour on baby Jesus, who had a helping hand in being a good child because he was the son of God and all that. And yet we tell our children to be obedient, mild, good, if they want Father Christmas to come. What mother won’t use everything at her disposal in those frantic weeks leading up to the big day? Maybe that’s my problem with it all. I’m agnostic. My belief tends towards Nature or the Universe or some Spirit of Humanity, rather than an all-seeing, all-knowing, all-powerful being. I respect the idea of Faith in God – envy it sometimes – but don’t have it. My husband is atheist. So, between us, we don’t believe in invisible beings watching and controlling our lives. Of course that didn’t stop me, last Christmas, saying a dozen times a day “Father Christmas is watching” although my aim was only to get them to smile. 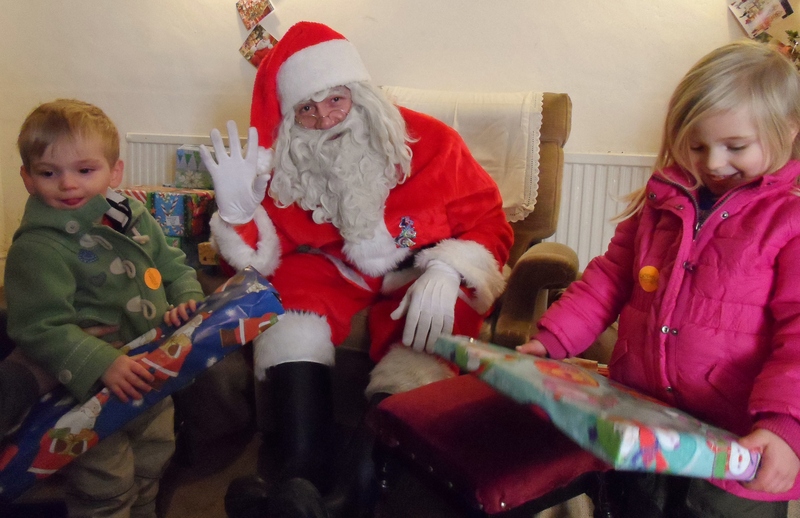 So, “Father Christmas is watching, show him your best cheesy grin.” It worked like a charm and staved off the teary tantrums of this time of year. My daughter goes to a Church of England school and I’m okay with that. Christianity is more than a religion. It’s part of my country’s heritage. She should know the tenets of the faith so she can choose later what she believes, armed with some knowledge. I went to a non CofE primary school until I was eight years old, and moved to where I live now. I didn’t know the Lord’s Prayer or any hymns, and my school friends were amazed. I’m glad that my daughter will learn them, if only for when she goes to weddings as an adult! However, if I let her challenge the stories of the bible, should I let her question the existence of Father Christmas? Already she doesn’t really seem to believe all that much. She said of her letter from Santa, “That’s really from you, Mummy, isn’t it?” and thankfully I didn’t actually have to lie because it came from a charity. Still it’s close to lying. She’s only four but I sense it won’t be long before she asks me outright if it’s all true. When that time comes, should I destroy faith, destroy the magic, or deceive a child and potentially break her faith in the honesty of a parent? My good friend solved the dilemma by taking her child, at five years old, to Lapland to meet the man himself. Pricey but maybe worth it to preserve the magic. I wonder if even that would work for my little girl (particularly as she hates the cold and snow!) even if we could afford it. Anyway, we seem to be okay for now. She accepts the existence of baby Jesus, she accepts the concept of Father Christmas. She’s excited about getting gifts and spending time with the family, but mostly she looks forward to opening her chocolate advent calendar every day and can’t wait until the end of term. Exhausted and tearful and tired, I think she’s approaching the arrival of Christmas pretty much as I am: with relief! There was an air of forced casualness in Conor’s words. Claire cradled the phone to her ear and looked out her bedroom window at the view down the hill to the sea. The hostel was a million miles away from the one in Swanage: clean, bright, modern, with comfy beds and duvets, and en-suite facilities. Despite the ache in her chest that told her she missed Conor, she was happy to be there by herself. Still the weekend was a few days away, who knew how she might feel by then. “I don’t have to come, if you’d rather be alone.” Conor’s voice sounded strained and Claire felt a shiver run across her skin. “Yes, of course you can come this weekend. Sorry, I didn’t mean to hesitate; I was just trying to work out which hostel I’ll be in by then.” A small white lie to take away the hurt. Claire leant against the wall and chatted about surfing, and the hostel, and her call home to catch up with her nephews. It felt strange, talking about things outside work. Conor listened attentively, asking questions and adding his opinion. Claire realised it had been a long time since she’d had a grown-up conversation with someone other than Kim. As the thought drifted through her mind, she remembered that Kim had wanted to catch up with her after the Carnival. “Damn.” Her outburst cut through Conor’s review of a band he had seen the week before. “Sure but it’s my fault, Claire. I kept you busy with work for the Carnival and then, well…” He trailed off. Claire couldn’t quite read his words. Was he not classing himself as a friend, or making a dig that she wasn’t putting him first? She shook her head. It was too hard to fathom. Wishing him a quick farewell, she hung up the phone then scrolled through for Kim’s number. “Hello, stranger.” Kim answered the phone on the second ring. “Hi, Kim. I’m so sorry I haven’t called sooner. The Carnival was manic.” She hesitated, unsure what to say about Conor. Before she could decide whether to mention it or not, Kim started talking again. “It’s alright for some. I’d give anything to get back to work. I’m still waiting for the doctor to say I’m fit.” She gave an irate snort and Claire felt her heart sink into her stomach. The happy Kim she had spoken to a week before seemed to have vanished again. “Oh yes. The prodigal daughter returned this weekend, proudly displaying her bump.” Kim cackled and Claire thought the sound didn’t suit her. She didn’t like to hear her friend being nasty, even about her sister. I guess it’s no different than how I feel about Robert. The pain in Claire’s head stabbed sharper. She wanted to empathise with Kim, but what did she know of babies and wanting to become a mother? She wasn’t even sure she wanted to be a girlfriend, never mind anything else. And the bitter jealousy in Kim’s voice was hard to take, however much she knew and sympathised with the cause. “Do you still want me to come and visit?” Claire held her breath, hoping for an answer in the negative. Claire inhaled silently and deeply, and then had a brainwave. “Why don’t you both come down here? I’m in a charming hostel, five minutes from the beach, and the forecast for the weekend is gorgeous.” She hesitated, then plunged on. “And you can come hang out with my new man, if you like.” If Conor came to stay, she wouldn’t have to share a room with Kim and Helena. As Claire hung up the phone she wondered if it was too late to get a flight to the Maldives before the weekend.